I completed projects for Pixel Reborn and Shilo. Through those contacts, I also coordinated some freelance for others for Bent Horizon. 1 - NCAA for Pixel Reborn. While I finished my part, it never went to air as it was shot and in the end I believe it got a full re-edit sans VFX. So it goes. 6 shots tracked. 2 - Julio Jones UA for Shilo. This was probably one of the best looking of the projects I had the pleasure of working on this past year. As usual, working with Shilo is also a good time. 9 shots tracked. 3 - O2 Runner for Shilo. Quick project completed over a weekend. 6 shots tracked. 4 - Powerade for Shilo. Lots of dark imagery and very little ground information for tracking, so it was one of the trickier series of tracks, but after a couple attempts it worked out. 7 shots tracked. 5 - Verizon for Shilo. Doubt I'll be able to find a video of this because from what I could tell it was for a corporate video for some Motorola Droid / mobile / business phone deal. 8 shots tracked. 6 - Title Tracks for Pixel Reborn. Not sure of the final project but there were some highway driving and hand held camera tracks that were pretty challenging. Shot on 7D or 5D, the issue of rolling shutter really needs to not be an issue any more. As much as I love the digital age for image and video capture, CMOS sensors and their issues really need to be a thing of the past... like... now. 5 shots tracked. This summer I had a one day job of Acting Visual Effects Supervisor on the set of Todd and the Book of Pure Evil. It was a fun day, a long day. If I'm right, it was the second episode of the second season. The premise was the "Student Body" where one girl, desperate for friends ends up latching on to people and eventually creating a slimy, stringy, fleshy blob of people. Across the 10 hour day, there were 2 digital effects that required my attention. There was supposed to be a 3rd and 4th, however at about the 9.75 hour mark, it was discovered that they had cut those shots. My day could have been just 3 hours. So it goes. It was a great time and a good learning experience. With the help of Bill Acheson, I finally got a website up and running and I edited together my demo reel. Have I been promoting myself? Not really, though I probably should. I've been very fortunate that the couple of contacts I have in regards to camera tracking have passed along my name and site. Just before Christmas, I got a call from a producer at Brand New School regarding potential camera tracking (it didn't happen). It turns out another producer I had worked with last year (like... 2010) passed my name and site along. I tell my students again and again that while this seems like a big industry, it is in fact, very small. If you're professional, do quality work, stay positive, and treat people with respect then you can do well. This was a good example of exactly that. Perhaps this should have been first, but I prefer to save the best for last. 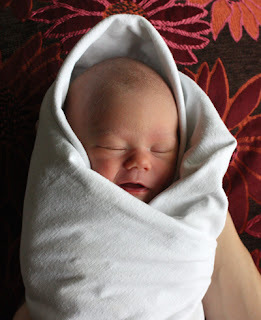 Nora Autumn, born October 11, 2011.